The Paradigm Symposium was founded in 2012 by Scotty Roberts and Micah Hanks as the public conference arm of Intrepid Magazine. Since then, the goal has always been to Bridge the Gap between the sciences and the alternative, offering a platform for reasoned presentation and dialog of ideas. Today, Scotty Roberts, John Ward, Rocci Stucci and Micah Hanks continue the tradition, and strive to continually bring people together to think and be inspired. What will it take to carry humankind to the stars? This question haunts us today as much as any time in our past. The more we progress as a civilization, the greater the implications—and perhaps the necessity—of answering such fundamental questions about who we are, what brought us here, and of greatest importance, where humanity is headed. The accumulation of knowledge—not merely space travel, but of all things that contribute to our greater prowess through understanding—have become paramount to humanity as we continue to grow. Yet with the passing of time, we also see more and more that an attitude of “out with the old” has become commonplace. Among our greatest minds today, we have seen a dismissal of many principles that have been instrumental in bringing us here; no better has this been represented in recent years, perhaps, than with acclaimed physicist Stephen Hawking’s insolent remarks about the demise of philosophy, within a burgeoning modern world that is moving ever-onward toward scientocracy. 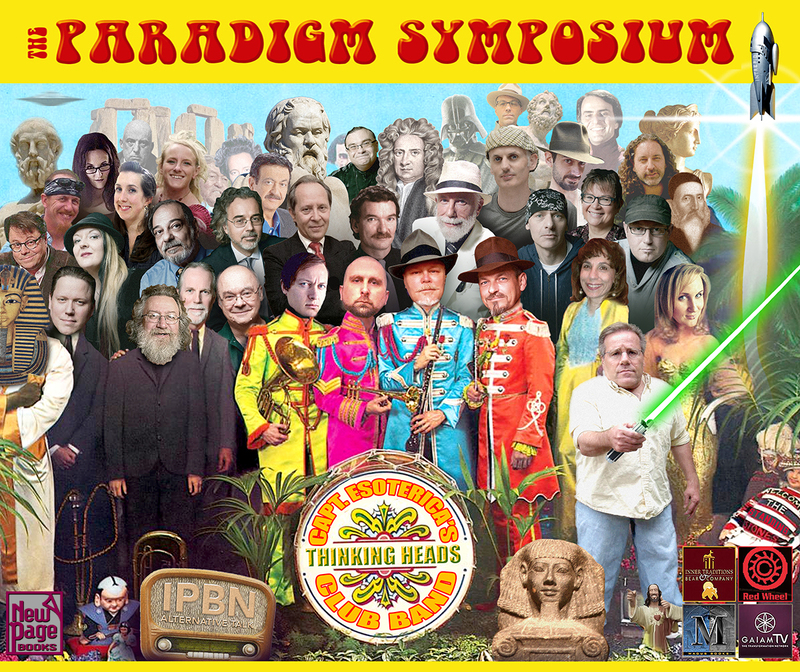 It was upon the foundation of open exchange of ideas and advancement of thought that the Paradigm Symposium was founded early in 2012. Plans were launched for an alternative conference in February of that year, and by the time of the October event, the conference had already gained foothold as one of the premiere alternative events in the country. Boasting a wide variety of speakers in various fields of interest and research, past speakers have included consciousness researchers, historians, evolutionary biologists, artists, travelers, philosophers, writers, and a host of other people from various walks of life and interdisciplinary areas. Graham Hancock, a British journalist and former international correspondent to The Economist, became fascinated with world cultures and traditions that involve ancient megalithic sites, altered states of consciousness, and the notion that there are unifying characteristics underlying many of them around the world. His seminal book, Fingerprints of the Gods, offered compelling theories about the possible existence of an ancient super-civilization. Erich von Daniken is an author and controversial pop culture enigma. Following the publication of his 1968 book Chariots of the Gods?, von Daniken has long championed theories pertaining to how humanity’s ancient past could be linked to contact with extraterrestrials, a notion that runs in stark contrast with attitudes in the scientific mainstream. PZ Myers is an evolutionary biologist, humanist, and outspoken critic of creationism. Known for his unabashed willingness to confront claims of the extraordinary, he has garnered as much attention for the controversy surrounding his public debates, as his notable writing and award-winning science blogging. Robert M. Schoch Ph.D. is a Yale educated geologist and associate professor of Natural Sciences at the Boston University College of General Studies. Schoch has long argued that the Great Sphinx of Giza is much older than previous studies indicate, and that its possible earlier origins may point to the activities of civilizations much older than accepted history can account for. As much as its speakers help illustrate, a diverse array of ideas have been presented at the Paradigm Symposium since its inception in 2012, and now in its fourth year, the Paradigm Symposium 2015 promises to be one of its finest and most thought provoking gatherings in its entire run. But there is more to the Paradigm Symposium than just what its speakers bring, and these elements have helped set it apart from being anything like the offerings of other popular conferences. Banquet dinners, roundtables and moderated panel discussions, exclusive cocktail parties, after-hours gatherings, and musical performances have helped carry the Symposiums well beyond comparisons with similar events in this genre. “The family atmosphere fostered by the Paradigm Symposiums is what we like to refer to as The AfterEffects,” says creator Scotty Roberts, a Minneapolis native. “These organic functions have not only served to expand the personal interactions, conversations, discussions, debates and sharing of theories as expressed on stage by our guest speakers, but also the intimate sharing of live music and singing.” Apart from music, this year’s symposium will feature a masquerade cocktail party, followed by a banquet dinner that features the “Wildly Inappropriate Poetry” of performer Arthur Greenleaf Holmes, and a concluding VIP panel discussion moderated by Ohio-based podcaster and personality Jim Harold. The Paradigm Symposium attracts people from all parts of the world, with attendees from Central America, Europe, and other regions traveling the distances to meet and share in the community that surrounds the Symposium; and with each successive year, it continues to grow. We appreciate your support of what we do, and hope that by learning more about The Paradimg Symposium, you will share in our conviction that this event offers its attendees more than just a place to go; it is a place where people come together, where ideas are exchanged, and where new knowledge is acquired. The Paradigm Symposium is a continuing tradition, and one that offers an ever-growing vision of our place together in this universe.